At the Seder we tell the story of a bunch of slaves becoming a free and dignified people. A new nation. That was then! On the last day of Passover, we "taste" the future freedom. A different kind of freedom. A freedom for all mankind... From jealousy! Anger! Hate! Suffering! Pain! From all the things that make the world ugly. When there will be just dignity. And beauty. And peace. This is now! On the last day of Passover we rejoice for a better world. A world that we create. We leave our struggles at the door. Enter a room filled with Joy. Optimism. Hope. And celebrate with a feast fit for a king--literally! Join together for the Feast of Moshiach - the last Passover celebration. Saturday Evening, April 27, at 7:15pm. Admission is FREE OF CHARGE! Sing songs (e.g. "Yechie," "Dayeinu" & other favorites). And most importantly, feel liberated! Become free. Taste the ultimate freedom. A freedom that's about to happen... NOW! Don't miss this powerful event: The Meal of Moshiach. Let yourself go! 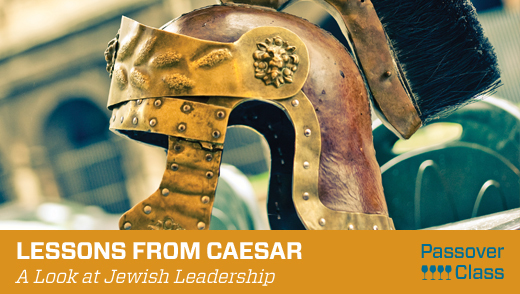 Take part in a new class "Lessons from Caesar"
"It's free of charge. Just let us know you're coming by emailing info@GotChabad.com! Just when you thought you had seen it all! The last day of Passover ("Acharon Shel Pesach") is particularly associated with Moshiach and the future redemption. The Haftarah (reading from the Prophets) for this day describes the promised future era of universal peace and divine perfection. Rabbi Israel Baal Shem Tov instituted the custom of partaking of a "Moshiach's meal" on the afternoon of the last day of Passover; in addition to the matzah eaten at "Moshiach's meal", the Rebbes of Chabad added the custom of drinking four cups of wine, as in the seder held on Passover's first days.. It is the perfect way to open our consciousness to the coming redemption.